Renewables should make up at least 30% of total global electricity generation in 2020, up from 23.7% in 2015. They also propose that no new coal-fired power plants be built anywhere in the world after 2020 and all existing coal plants begin being retired. Countries should commit $300bn annually to help cities and states fully decarbonise buildings and infrastructure by 2050, with cities upgrading at least 3% of their building stock to zero- or near-zero emissions structures each year. Electric vehicles should make up at least 15% of new car sales globally, up from around 1% today. They also suggest a doubling of mass-transit utilisation in cities, a 20% increase in fuel efficiencies for heavy-duty vehicles and a 20% decrease in greenhouse-gas emissions from aviation per kilometre travelled. Mission 2020’s set of proposals are sweeping and would represent a major ratcheting up of international commitments to tackling climate change. It comes at a time when, paradoxically, the US is withdrawing from the international process, whereas some other countries are more firmly committing to emission reductions. Some of Mission 2020’s goals, such as ramping up the sale of electric vehicles to 15% of all vehicle sales in the next three years, are likely to very challenging to achieve. “The most important point of this commentary is that we are living in an incredibly exciting time in human history. We’ve realized that for our own sake we need to manage our environmental resources at the global level, including the atmospheric garbage dump that we currently use for our greenhouse gas waste. We are actually responding to the climate change challenge. Our energy system changing at dramatic rate, and these changes and also economically viable. But we also need to look at other sectors including food, transportation, finance, buildings and industry. Change isn’t happening at rate it needs to to meet Paris targets, but it is still possible to do so, so now is our moment to act. 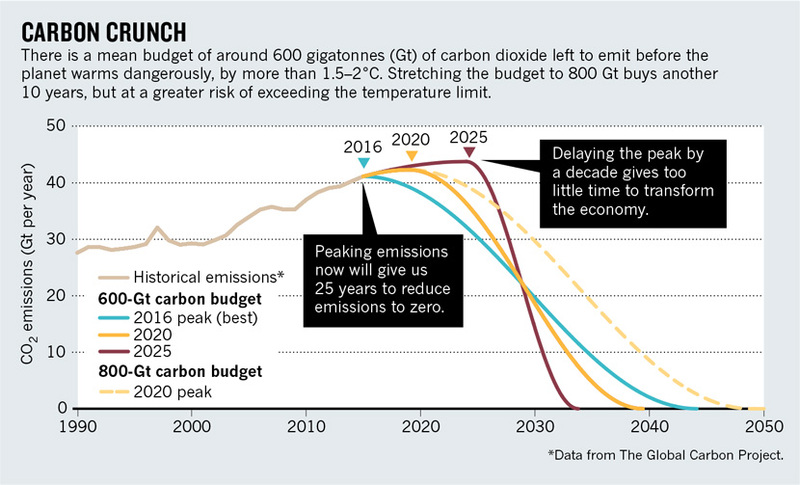 “We have a vanishingly small remaining carbon budget, requiring global emissions to be net-zero within a few decades without the large-scale removal of carbon dioxide from the atmosphere. The mitigation challenge is immense, requiring deep emission cuts in all countries, rich and poor. To get emissions to zero in the space of decades requires an unprecedented technological and behavioural revolution. Powerful incumbents may resist, and so we need smart ways to make the low carbon path irresistible. “This comment is the latest one in the tradition of climate policy wake-up calls that are combined with a particular deadline. It perpetuates a narrative dominant in climate policy for more than 20 years: “It’s five minutes to midnight, time is running out (for 2C), but we can still make it if we start to act now.” The problem with this: policymakers and the media indeed notice, but what they hear is not “we really have to start to act now”, but “it has always been five minutes to midnight” (since scientists/activists have always found another way to present just another deadline some years later). “Plans like these are great thought experiments about what may be physically possible. However, such plans become problematic when they are presented as feasible plans of action. It is technically and physically possible for us to end all war today. It is simple. All we need to do is put down our guns and open our hearts. Is calling for everyone to put down their guns and open their hearts today a good thing to do? Probably. International policy | July 7. 2014.
International policy | December 12. 2013.
International policy | April 4. 2016.